Other Notes: Infant/Child Reduced Energy Defibrillator Electrode Pads for patients aged 1 - 8, 55 lbs or less. 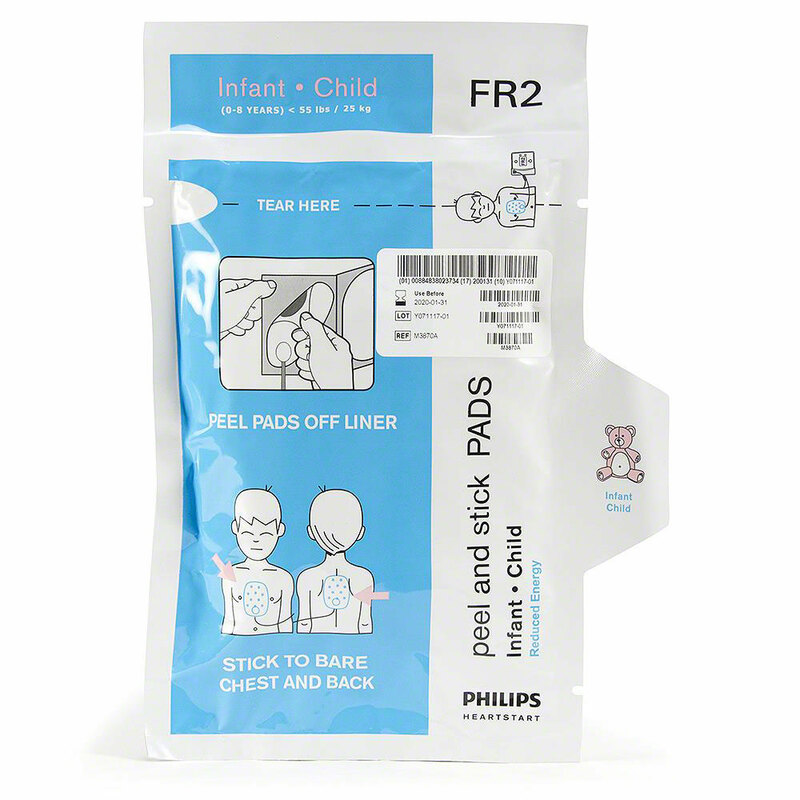 These Philips Infant/Child Reduced Energy Defibrillator Electrode Pads are for use with Philips HeartStart FR2+ AEDs (models M3860A and M3861A) or Laerdal HeartStart FR2 series AEDs (models M3840A and M3841A). These are fully functioning AED electrode pads for use on children up to 8 years of age or up to 55 lbs. (25 kg.) in body weight. When used, these electrode pads reduce the energy level administered to the patient from the adult dose of 150 joules to a child dose of 50 joules. They are single-use and disposable. 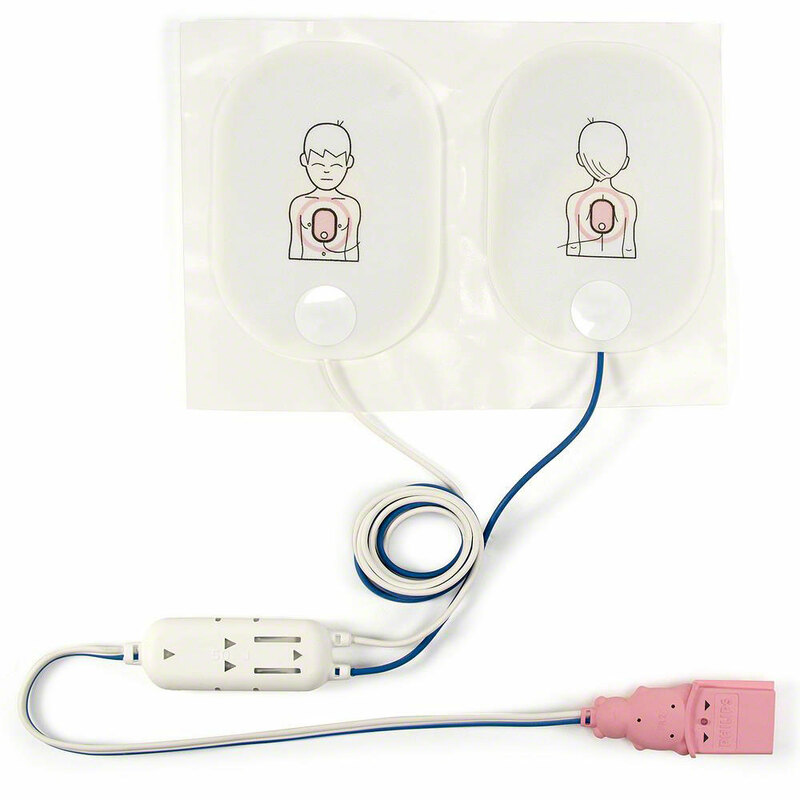 These electrode pads are NOT for use with the Philips ForeRunner (FR or FR1) AEDs. As with an adult patient, remove all clothing from the patient's chest and make certain the patient's chest is clean and dry. Tear open the Philips Infant/Child Electrode Pad package and remove them. Turn your Philips FR2+ or Laerdal FR2 AED on. Peel the first electrode pad off the backing and, following the picture, press the pad firmly to the patient's bare skin. Do the same with the second electrode pad. Plug the Infant/Child Electrode Pads into the defibrillator. Always refer to your AEDs Operator's Guide for detailed instructions. 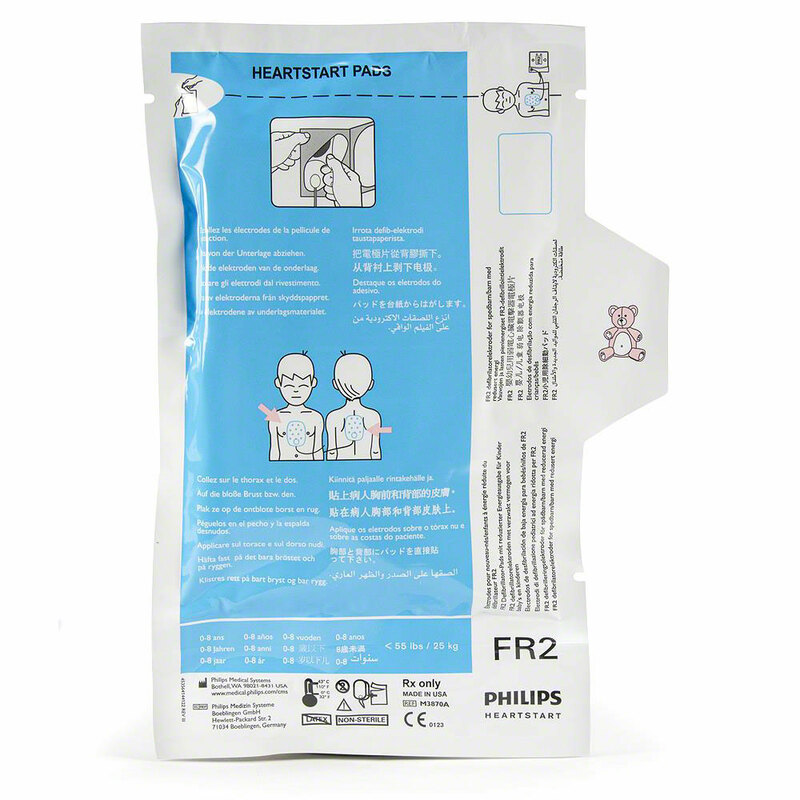 The AED Superstore has a great price on these Philips HeartStart FR2 Pediatric AED Pads. To place an order just call us and a friendly, knowledgeable customer service agent will help you. Or, click to add it to your cart to purchase online. It's fast, safe and secure. This item is a set of standard pediatric pads. It comes packaged in a sturdy box so that the dose attenuater does not become damaged during shipping or storage.